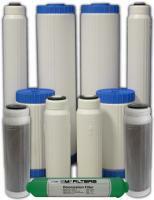 Specialty Water Cartridges - Specialty Water Filters | Applied Membranes Inc.
AMI manufactures a wide variety of specialty filters. 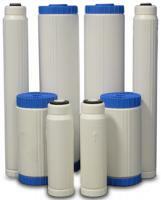 These filters contain medias which are specially designed to remove specific contaminants from the water. Listed here are the most frequently requested filter types. We are able to supply a wide range of specialty filters. Please contact us with your specific requirements if your filter is not listed. Phosphate Series cartridges are non-refillable polyphosphate-adding cartridges designed to sequester iron and hardness to prevent scaling. HydroBlend is a unique composition blended to provide superior limescale prevention and corrosion control in water fed equipment. Raise the pH of RO permeate to make it non-aggressive and compatible with copper piping. Non-regenerable deionization polishing cartridges are designed to give multi meg-ohm quality water for analytical and general laboratory use. The NRC brine regenerable RO polishing filter will remove virtually all nitrates, nitrites and sulphates from tap water or RO product water. KDF Filter Cartridges contain a blend of KDF and high activity de-dusted granular activated carbon to give extremely effective and long life de-chlorination capacity. 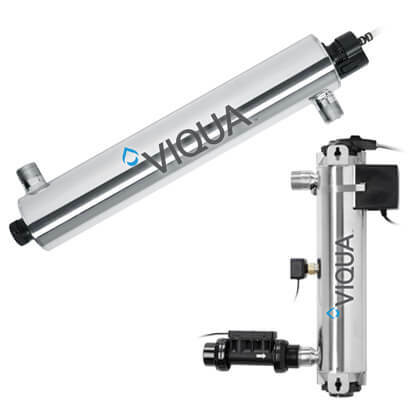 AMI cartridges fit into standard filter housings and can be filled with your filtration media of choice to create a custom water treatment solution.